When purchasing hardwood flooring it is important that your room is measured correctly so that you have enough flooring to complete the room, but equally you do not want too much waste or left over flooring. Before you start to measure your room you will need a pen and paper, tape measure and calculator. 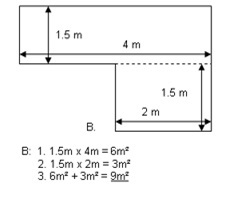 You can simply adapt this method of calculating the area of an irregular shaped room if you have more than two sections. Simply split the room into manageable sections of squares or rectangles, work out the areas of all of the sections, add them together and add on 5% for wastage. • Never guess the size of you room – always measure accurately with a tape measure. • Remember to measure right into the doorways of the room as the flooring may be laid there too. • Always measure your room in metres because flooring is usually sold in metres. • Remember to double check all of your calculations and use a calculator if necessary. • You must add 5% to your final area for wastage, otherwise you may not have enough flooring to finish your room. 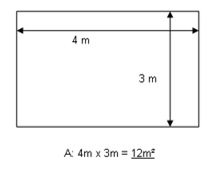 If you are unsure about your measurements or have any problems with working out the area of your room you can send us a drawing by email, fax or post, and we can work it out for you. post: Unit 5, Euston Street, Freemens Common, Leicester, LE2 7ST.